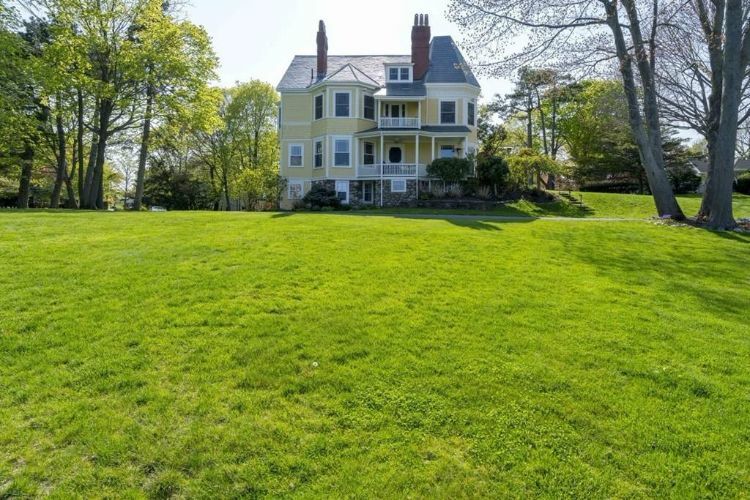 Built in 1900 for a wealthy clothing manufacturer and his wife, this cheerful Victorian home in Swampscott, Massachusetts, sits on a private piece of land almost an acre in size. 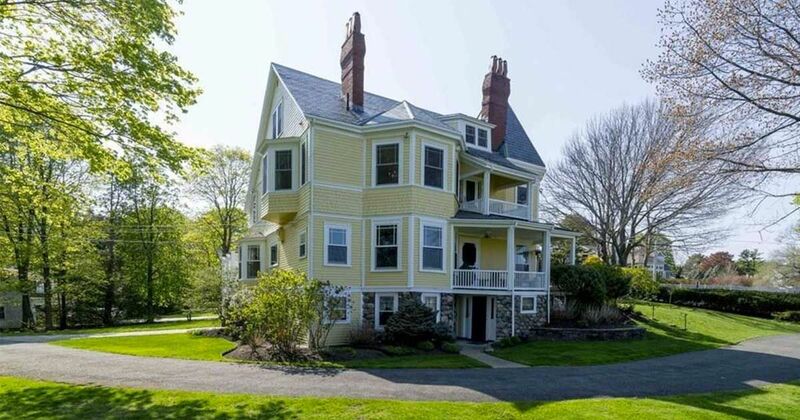 It's surrounded by lush, landscaped lawns and gardens, and it's even more beautiful inside than out! 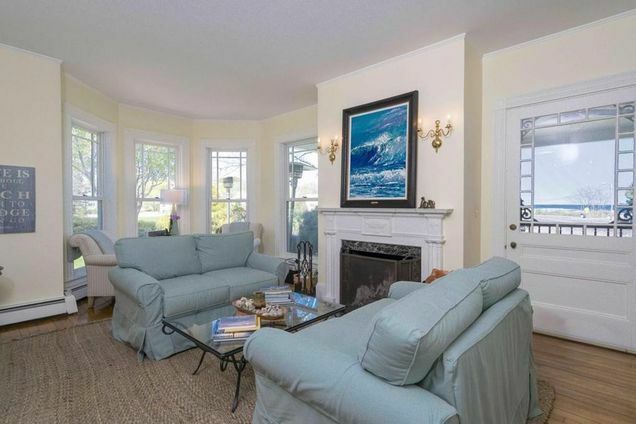 Known as Summerview, the home is 3,988 square feet, and it has a grand total of 11 rooms. With five bedrooms, three full bathrooms and three half bathrooms, the house has plenty of room for even a large family. Any child would be lucky to grow up here; keep scrolling to see the rest of the extravagant home! 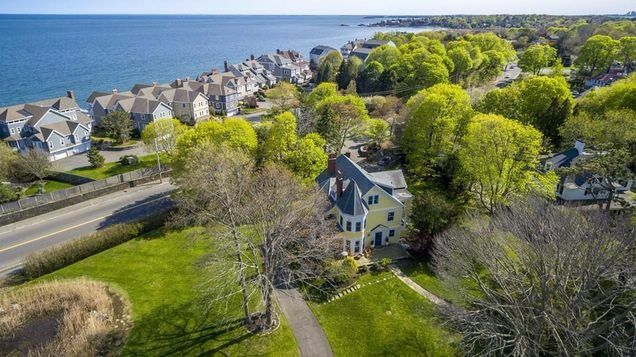 As you can see from this aerial shot, the house is just steps away from a stunning beach. 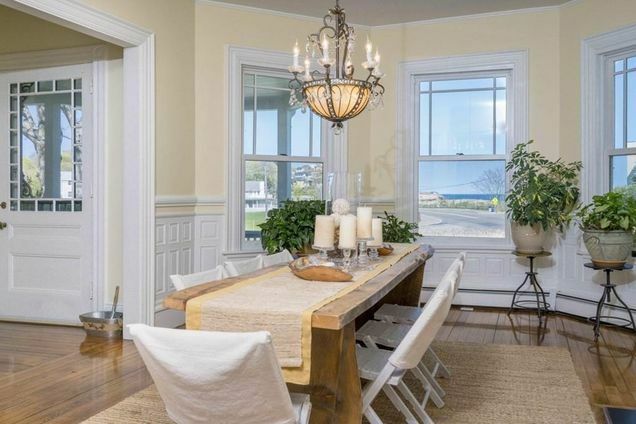 Of course, fabulous ocean views can be seen from all three levels of the home. The formal dining room is located on the first floor, and it boasts wood-paneled walls and a gorgeous chandelier that adds just the right amount of Old World charm. The ceilings in the room are 10 feet (about 3 meters) high, making it perfect for entertaining, and the large windows provide a lovely view of the water. 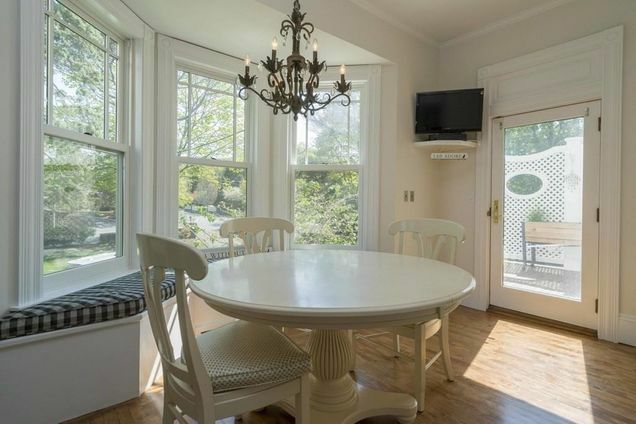 If you're in the mood for a more informal meal, the cozy breakfast nook makes the perfect retreat. Step out onto the patio after your meal to soak up some sun! 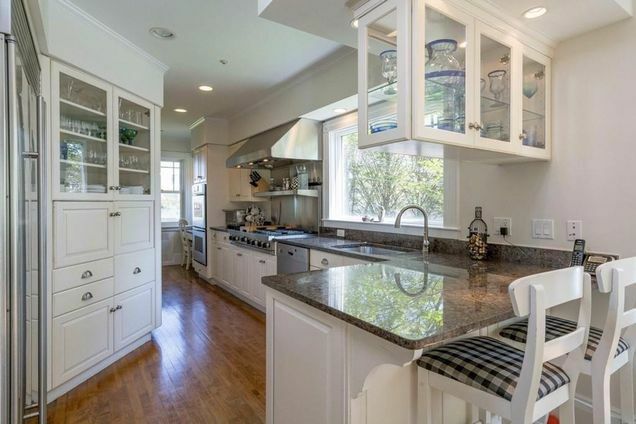 The kitchen features gorgeous custom cabinets, as well as granite countertops and stainless steel appliances. Double ovens and a six-burner gas stove make it easy to feed a crowd! A large bow window fills the living room with plenty of natural light, and the views from the window are beautiful enough to be a painting. The wall sconces above the fireplace provide an elegant source of light when night falls, and delicate details carved into the fireplace mantle are worth noting. 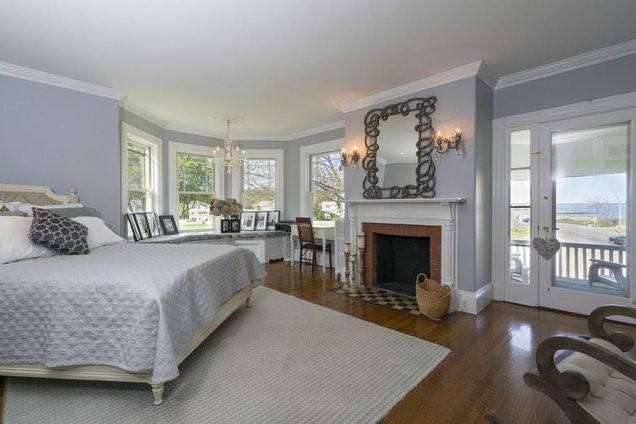 The master bedroom on the second floor is practically large enough to be a home in its own right. 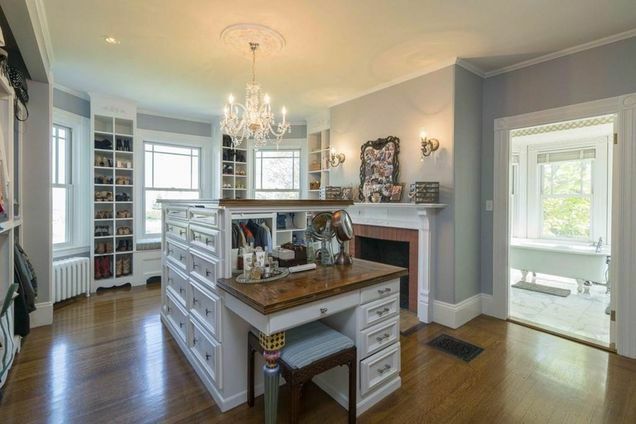 It has a lovely fireplace, a handy desk set in a bow window and plenty of room for a king-size bed. The views from the windows are stunning, as are those from the private covered porch accessible only through the bedroom! Considering that the house was built for a clothing manufacturer, it's no surprise that the huge walk-in closet looks like every fashion lover's dream! A cozy fireplace and an elegant chandelier give the room a Victorian feel, and the endless cupboards and shelves ensure that storing clothes will never be a problem. With a claw-foot tub in addition to a spacious shower, the en-suite bathroom in the master room is just as extravagant as the closet. 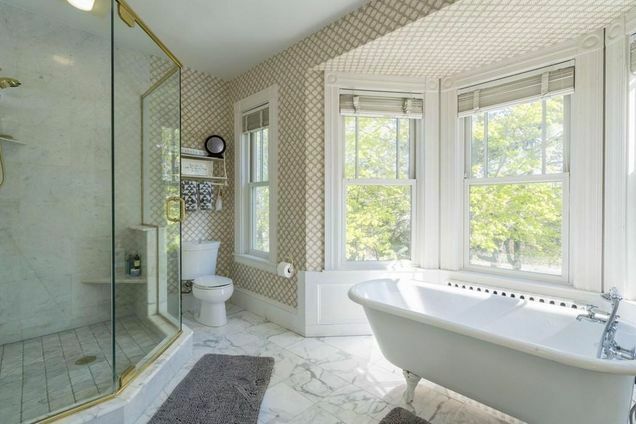 A double vanity (not pictured) means that sharing the space is easy, and the gorgeous views from the bow window make soaking in the tub an even more enjoyable experience than it otherwise would be. Would you like to wake up to these beautiful views every single day? Let us know in the comments below, and make sure to share this gallery if the answer is yes!